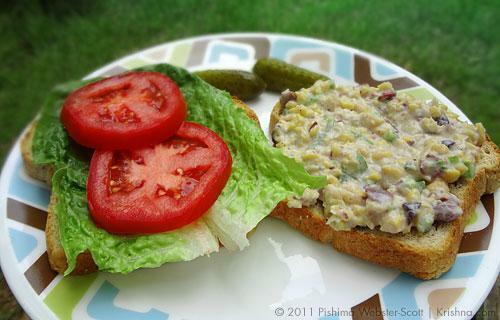 I love this sandwich because it is packed with yummy protein and is quite healthy. If you are planning to take these delicious sandwiches on a picnic, I recommend either making the chickpea of the sea salad a little drier or assembling the sandwiches right before eating to avoid soggy sandwiches. Summer is quickly approaching and the temperature, where I live, is slowly creeping towards 90. As it gets hotter and more humid my tolerance for hot food goes down. 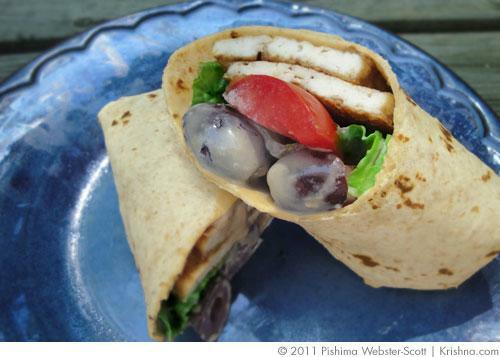 When it’s above 90 degrees I often turn to sandwiches, wraps and salads--and this particular wrap is filled with yummy goodness. Also, lettuce is in season and makes a lovely addition to any wrap, sandwich or salad. Delicious "burgers" made out of split peas, oats and carrots. They are ridiculously easy to make and just as easy to eat. 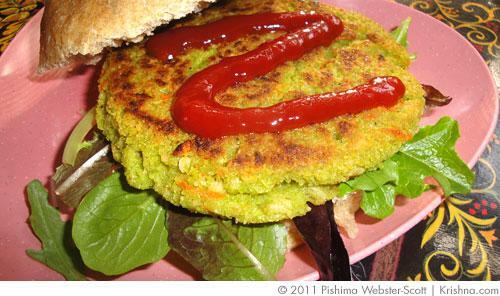 Bhima burgers are delicious on home baked buns or also plain with some ketchup or chutney.